2015 September «Come Play In The Kitchen! Come Play In The Kitchen! So now that D has moved on and I no longer have a personal chef kind of catering to my hunger whims (drat! ), I have had to start meal planning again. Which is great – if you have your calendar handy so you remember appointments and other things that you need to work around. There are many nights when activities prohibit me from spending quite as much time as I’d like in the kitchen because of chauffeur duties and now, after years of being home, work. So it’s important to have a sort of repertoire of quick and easy meals, aside from pasta, to throw together. Besides that, my oldest daughter got married just last week, and I’d been canning peach jam for wedding favors. Yeah – busy! 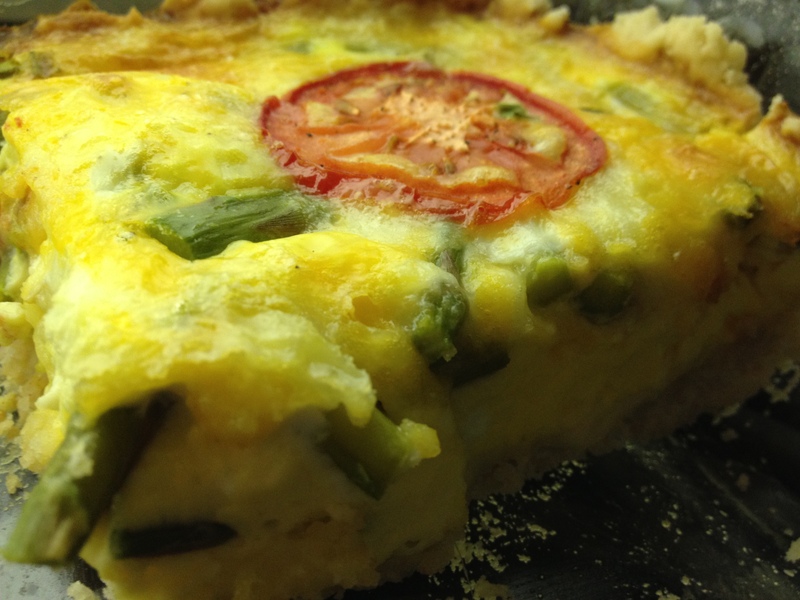 One of the things I like to make for a quick supper is quiche. My family likes it served with a salad and maybe some (homemade of course) applesauce on the side. I’ve followed some of the classic, standard recipes over the years, but I must confess that I often tend to get bored with the same ol’ same ol’. Not that I don’t appreciate a good Quiche Lorraine, but…! So, if I haven’t said so before…My usual method is to follow a recipe exactly the first time or two, to see what it should look and taste like, and figure out how it’s ideally constructed. After that, I start to maybe get a little brave. Maybe. A quiche is a great opportunity to take advantage of seasonal produce because it’s almost a blank canvas, transformed by the variety of cheeses and the myriad types of other ingredients you can throw in there. While I haven’t discovered a way to quite veganize it wholly to my liking (still searching for the perfect vegan cheese…<sigh>), I have made meatless quiches as well as gluten-free, so it is easily adjustable for most diets/eating styles. And you can also experiment with the crust – adding fresh herbs or spices or even go “naked” without one. It is also a great way to use leftover meats, veggies, fruit, and even a bit of grain, though I’ve not experimented with that as much…Crazy, right? But oh-so-frugal if you have the chance to use what’s on hand or at the very least seasonal. I actually made my own from scratch, but you could use a pre-made crust if you’re pressed for time. This quiche fits into the bottom of a 9×13 pan, but you can use it for two 9″ or 10″ pie crusts instead. With our family size, the 9×13 works great and cuts into eight neat little squares, which I find easier for me. But neat little slices work just as well and are equally delish! * I use a recipe that is close to the pie crust featured in Joy of Cooking, but you can use any standard crust recipe. I take 2 1/2 cups flour and sift with 1 1/4 tsp salt. (Because one of my kids got out the actual blender when I was asking for help, I will note here that you do NOT use a regular blender – a pastry blender is its own kitchen tool, as pictured here on the left . 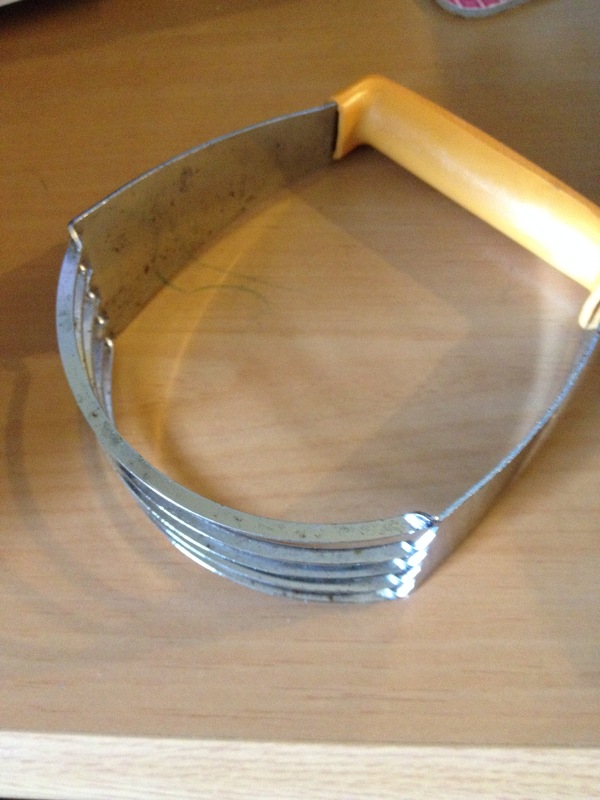 I’ve also heard it called a pastry cutter…terminology probably depends on your location). If you don’t have a pastry blender, you can easily use either your fingers, or a food processor. When the dough is worked together, it should be slightly crumbly, kind of like the consistency of cornmeal. * This is where I vary my crust recipe from Joy of Cooking. (Their recipe uses 6 Tbsp ice water total.) I add 1 Tbsp ice cold water, then mix dough. I add another 1 Tbsp ice cold water and mix further. Then I add 2 Tbsp chilled vodka, usually from the freezer, and mix the dough until it comes together easily in a soft ball. I learned this trick years ago. The vodka seems to give the dough a very nice flaky finish when baked. I’ve done it this way for all my pies for years. If the dough won’t come together, add ice cold water 1 Tbsp at a time until it is smooth. Don’t add too much. The dough will be sticky and you will be disappointed with the results. * At this stage, I may or may not add 2 Tbsp finely chopped herbs. I use whatever I have on hand, which is usually either cilantro or parsley, but sometimes I have chives, or even sage, rosemary and thyme (yes, just like in the Scarborough Fair song…). * I then roll out the dough into a 9×13 size and place into a 9×13 pan coated lightly with cooking spray. If you use a buttery pie crust recipe, you can probably omit this step. Another note: I don’t pre-bake for this particular quiche, but if I’m using a recipe that has more egg/cream mix, I may for just a few minutes at 350*F so crust doesn’t get too soggy. * Trim rough ends from one bunch of asparagus and blanch, then cut into thirds (or smaller, if you’re not a fan of large pieces). * Next, I beat 10-12 eggs in a 4 cup measuring cup until smooth, and add milk -or- heavy cream to the 3 cup mark. * To assemble, I layer 6-8 slices of smoked Provolone cheese over the crust, then top with the asparagus. I then add 1 1/2 cups shredded cheese (I usually like mozzarella, but any will work). Pour the egg mixture on top, and distribute evenly. Sprinkle another 1/2 cup shredded cheese over the egg mixture. Cut 1-2 Roma tomatoes into slices and arrange neatly on top, then season with a little sea salt and pepper. I often will sprinkle a little grated Parmesan over the whole quiche. * Set quiche into 350*F oven and bake 20/25 minutes. My oven is fussy, so I start checking it at this point to see if the eggs look set. If they are a little loose in the middle that can be fine because they will still tend to cook after you remove the quiche from the oven. Some people like their eggs very “hard”, so I will leave the quiche in the oven a little longer, but be cautious that you don’t overbake the crust. If you’re using a clear/Pyrex 9×13 pan, you can see the crust through the bottom. Once you do this a time or two, you’ll know just what time you want to take it out of the oven so that it suits your tastes. I cool slightly before serving because I don’t care for my eggs when they are piping hot, though some people may. Use your judgment when determining how done you like your quiche. As I stated earlier, this is a great way to use various ingredients and it’s really not too fussy. Well…that’s my version of asparagus quiche. I love experimenting when fresh produce is in season! You will too – so go play in your kitchen! !